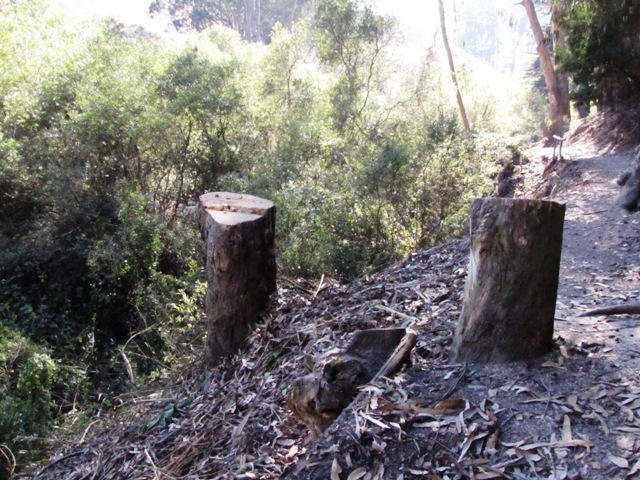 On October 24th we reported the planned tree removals along the Creekside Trial (west side of Islais Creek) in Glen Canyon. 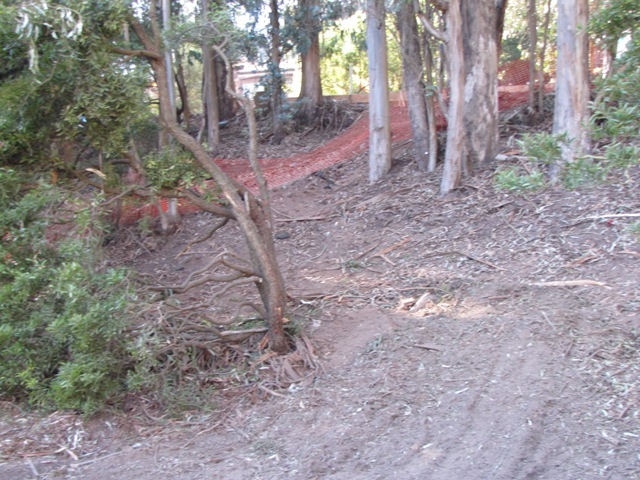 We are now submitting aftermath photos: the conditions now, after the Glen Canyon Trails project “tree work”. 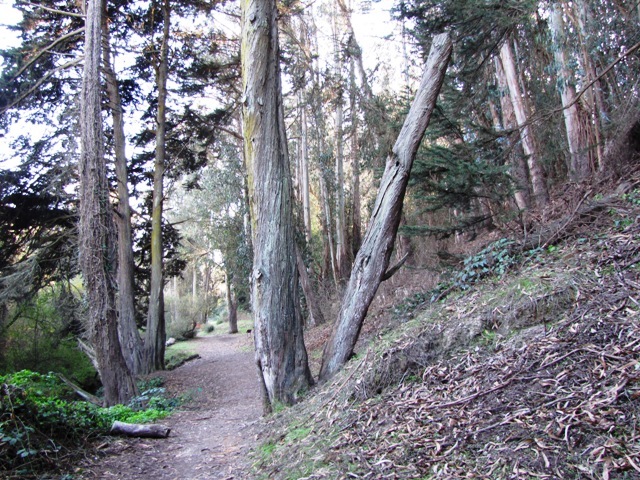 Background: HORT Science, recipient of Park Bond funding, is used by the Rec and Park Park dept to assess the suitability of trees located along the proposed trails. 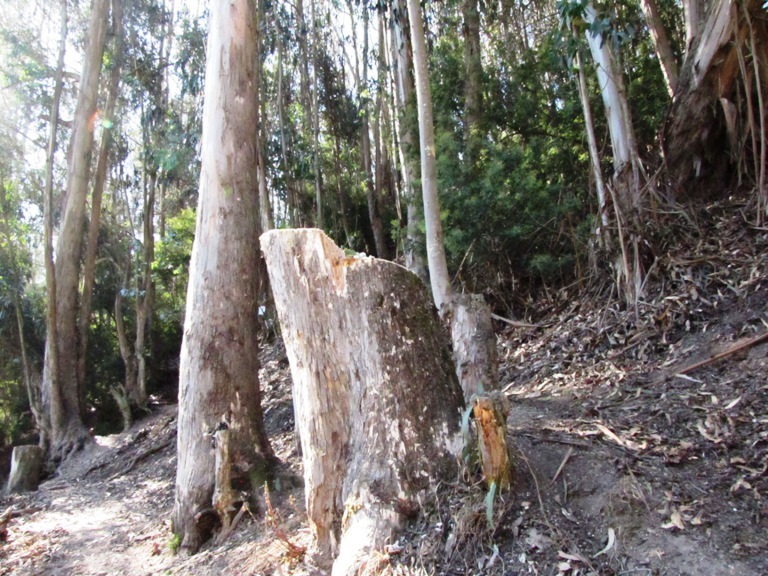 Their September 6, 20013 report for Glen Canyon Park is here. 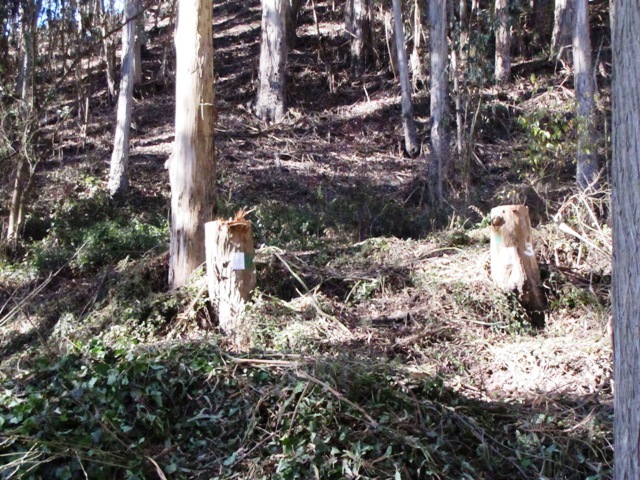 In summary they recommended that 30 trees be removed: 26 blue gums, 2 arroyo willows and one each of yellow willow and Monterey cypress. 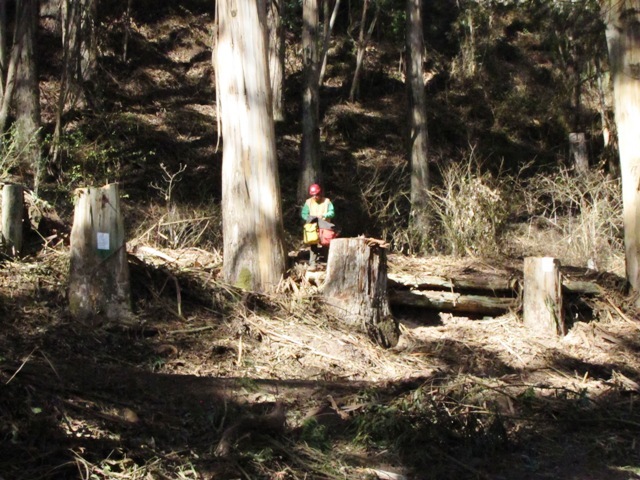 Ten (10) trees were identified as needing to be pruned including 6 arroyo willow, 2 blue gum, one Monterey cypress and one river red gum. 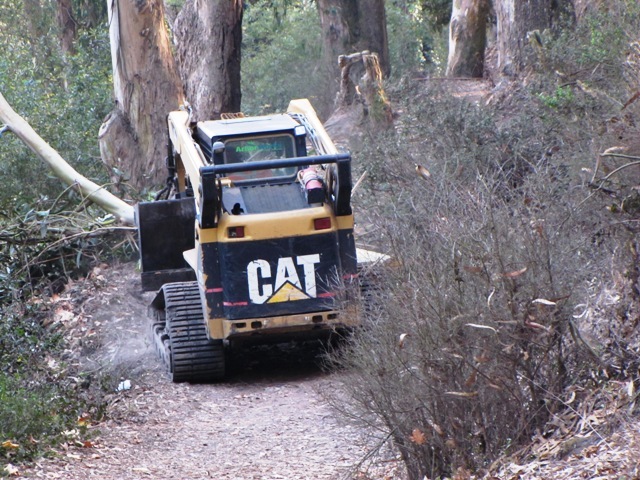 Park and Rec is calling this “…completing hazardous tree mitigation work” but does not address how these trees could be saved by re-rerouting or narrowing trails, thinning the crowns, pruning and tipping, weight redistribution, limb removal, and cabling or bracing. 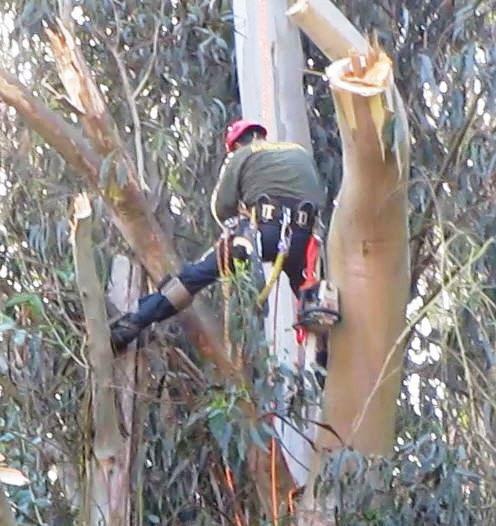 Even healthy eucalyptus trees are rated negatively by HORT and RPD as unsuitable for preservation merely because they are not native and therefore considered invasive. 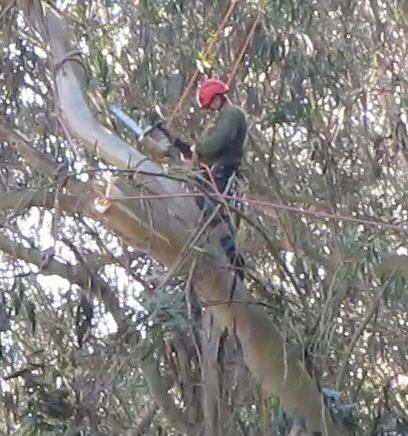 A crane was used on Alms Road, (Tuesday, October 29) to take out a tree that had the misfortune of growing in the middle of Islais Creek. 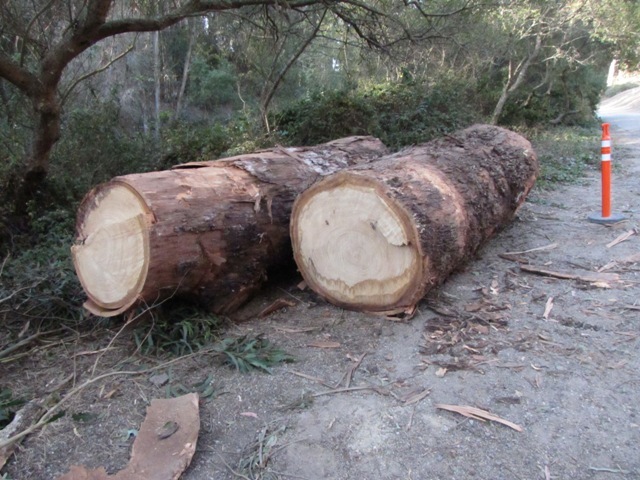 A Blue gum, trunk diameter 50 inches, was deemed a potential hazard (said HORT: “Center of creek. Stands alone. Leaning & bowed E. over Alms Road.” ). 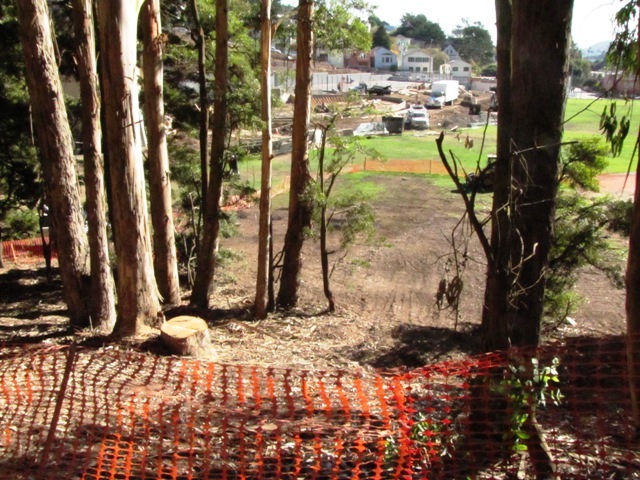 Replacing trees with concrete retaining walls to make a natural area more natural? 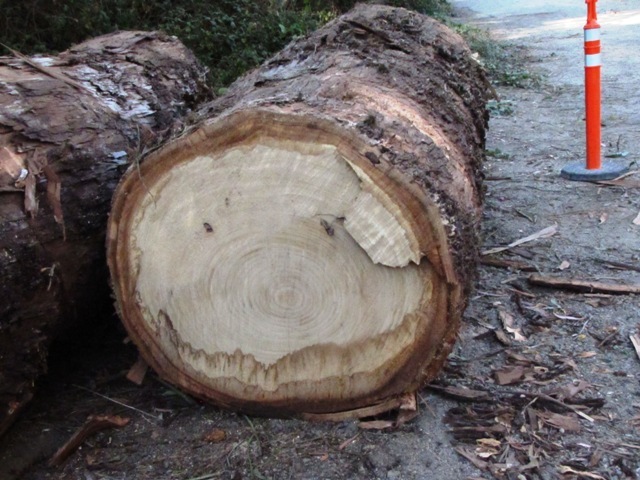 Mature trees absorb carbon and make our air cleaner. Dead ones release carbon and add to green house gases. 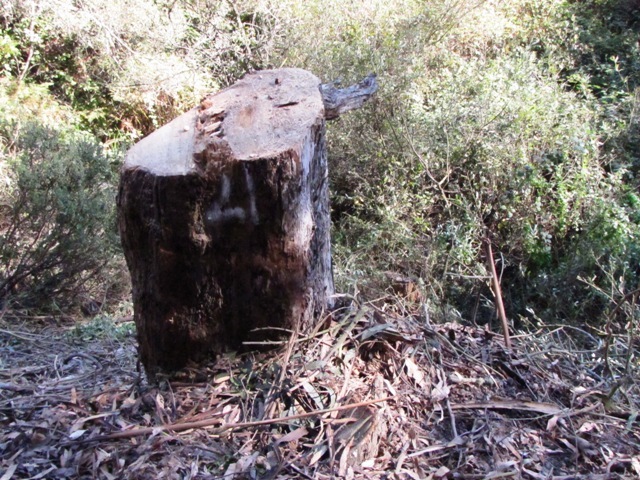 Some of HORT’s reasons for the decisions to remove selected trees: “poor form & structure”; “Sharp lean E. over trail”; “upright but one-sided towards trail”; “Leans over trail”; “cracked branches”. 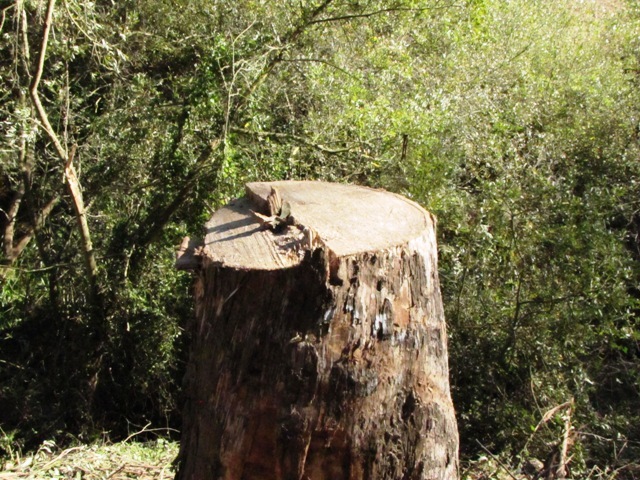 Let’s repair these trees rather than destroy them. It would cost less money and be better for the environment. 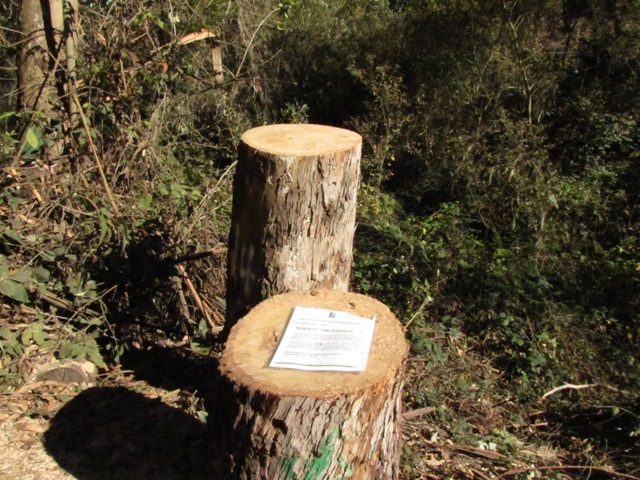 Ugly stumps left to remind us of how well are Park Bond dollars are being used to destroy our parks. 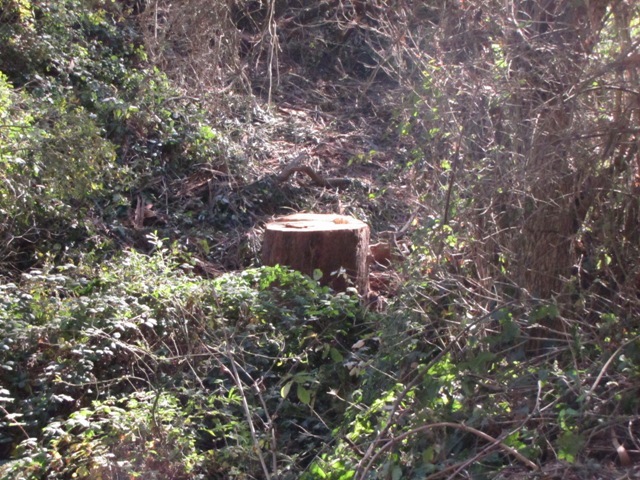 Are our children being taught by RPD that the best tree is a dead stump? 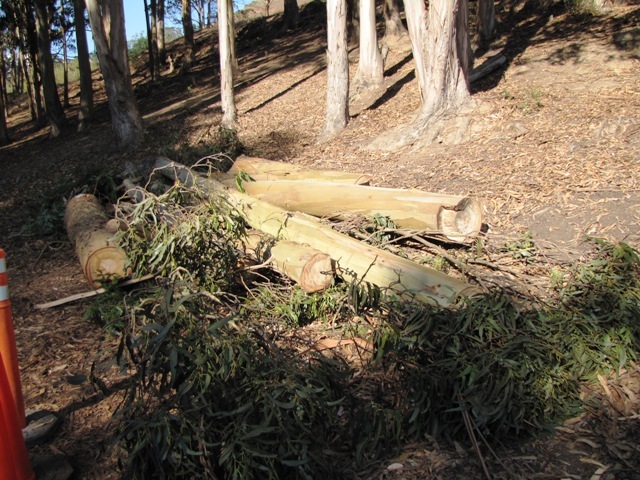 We, however, are less excited when we observe the tree damage to what was a wonderful, quirky trail on west side of Islais Creek in Glen Canyon Park. for this Glen Canyon project. 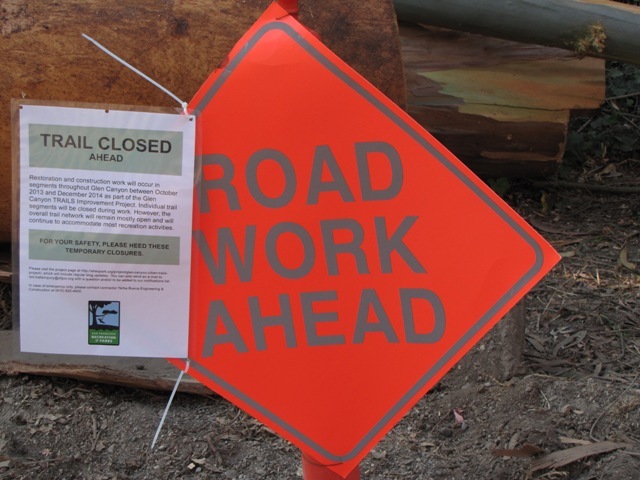 That’s alot of money for ADA compliant pathways, ‘turnpike’ parkways, retaining walls, split rail fences – from Bosworth St, all the way up to Portloa Drive, past the School of the Arts (SOTA). Note: Photographs were taken recently, all are accredited to Ron Proctor. 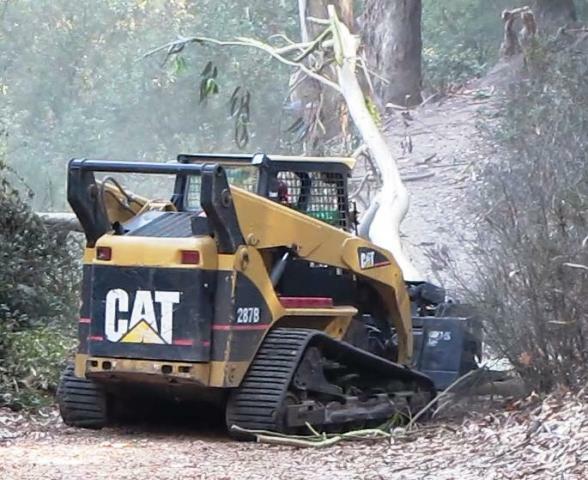 Wish I’d known this is the kind of destructive thing they’d be doing in the parks or I’d never have voted for any kind of park improvement bond. Lesson learned. 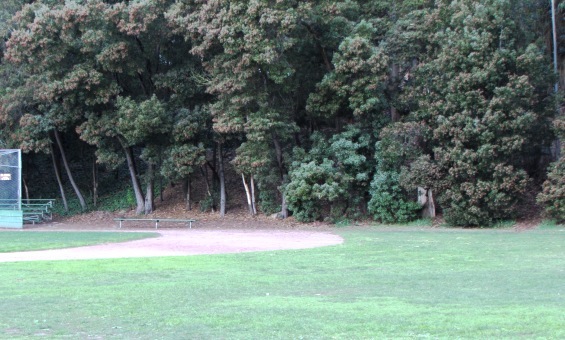 Can’t trust Wreck & Park to do the right thing for our parks and environment.